Foreign and Expatriates Ministry voiced the government’s strong condemnation of Turkey’s repeated attacks on the Syrian people and its transgression into the Syrian territory. “Turkish artillery shelling of Syrian territory constitutes direct support to the armed terrorist organizations,” the Ministry told the UN Secretary General and the Security Council’s Chairman in two letters addressed to both officials. It was referring to shelling by Turkish artillery based inside Turkish territory of Syrian land targeting Syrian Kurds and Syrian army sites. The attack was launched on Saturday afternoon and continued on as the Turkish artillery also targeted the civilian populated villages of Maranaz, al-Malkieh, Minnegh, Ein Daqneh and Bazi, according to the letters. The shelling came in response to the Syrian Arab army’s advance on military fronts in the northern countryside of Aleppo province and in a bid to boost the morale of the armed terrorist organizations, the Ministry clarified. It went on citing Turkish attacks in more Syrian areas on the same day, saying that 12 pickups with DShK and 14.5 mm machine guns mounted on them had their way from the Turkish land into Syrian territory across Bab al-Salameh border crossing. The Ministry noted that the pickups were accompanied with 100 gunmen, some of them are believed to be Turkish soldiers and Turkish mercenaries, adding that munitions supply operations into the Syrian Aazaz area continue. The Turkish attacks, the letters said, were coupled with statements made by the Turkish Prime Minister Ahmet Davutoglu that confirmed Turkey’s blatant intervention in the Syrian affair and the continued Turkish support to Jabhat al-Nusra, al-Jabha al-Shamiya, Ahrar al-Sham and other al-Qaeda-linked terrorist organizations. These statements, the Ministry said, officially attested to the Turkish regime’s premeditated acts of violating the Security Council’s resolutions related to combating terrorism. The Ministry referred in its letters to the chiefs of the UN and the Security Council to the “irresponsible” actions of the Turkish regime that caused the recent Geneva intra-Syrian meeting to fail. 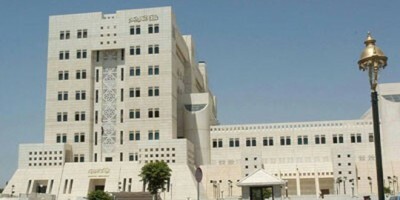 The Syrian government expresses strong condemnation of Turkey’s repeated attacks on the Syrian people and its transgression into the Syrian territory, calling these attacks “a gross violation” of the Syrian sovereignty and a flagrant breach of the UN Charter’s objectives and principles, the rules of the international law and the Security Council’s counterterrorism resolutions, the letters said. Syria, however, stresses that it will maintain its legitimate right to respond to the Turkish crimes and attacks and to claim compensation for the damage caused, the letters added. The Ministry also conveyed the Syrian government’s call on the Security Council to assume its responsibility to put an end to the Turkish regime’s classified crimes against the Syrian people and its repeated attacks against Syrian territory. The government also demanded, according to the letters, that the Security Council work to compel the countries backing terrorism, including Turkey, to comply with its relevant resolutions on fighting terrorism and bring them to account for their unlimited support to the terrorist groups.